Yeah, new art starts at tiles020, and we are up to tiles026 now. None of that is textures, by the way -- if mappers want to add 8-bit Duke palette textures, that's fine, but so far we haven't added any. In my mind there is no intended renderer, but everything is classic compatible. The standard community voxels are used but no models or 32-bit graphics. We are also using the extended Lezing palette. The only thing that leans towards polymost is the skyboxes by Fox, but I see those more as fixing a polymost deficit than adding a feature. Depending on which way you ultimately decide to take it. One way you could have Bombshell literally teleport out before she reaches "death." Literally going "See ya" and teleporting with the teleportation effect. If she's an item in the player's inventory (A radio, say.) it could have to recharge to 100% before you can use it again, and it could be something you lose on level changes. And the reason I suggest teleporter is because helicopter might not be fitting for say, space maps. Teleporter would be a little more versatile. Hate to double post, but this just occured to me actually, as an adendum to my last post. One thing that might be really cool to do with the whole teleporter idea is if you place the Bombshell character into a map, you could have it that when the player enters either a certain radius or "line of sight" of the actor sprite, she teleports in all action-hero like. This could be a further random aspect to her appearance in vanilla maps. Beautiful---and not just because Bombshell is in it. With everything I hear and see about this, my anticipation continues to rise. July can't get here soon enough! Jblade: Wow thats bright. Good thing Bombshell and Duke are wearing sunglasses. JBlade: I see the DN64 gun! The super-bright and colored lights are made possible by Lezing's extended palette lookups. The washed-out white is pal 94, for example. 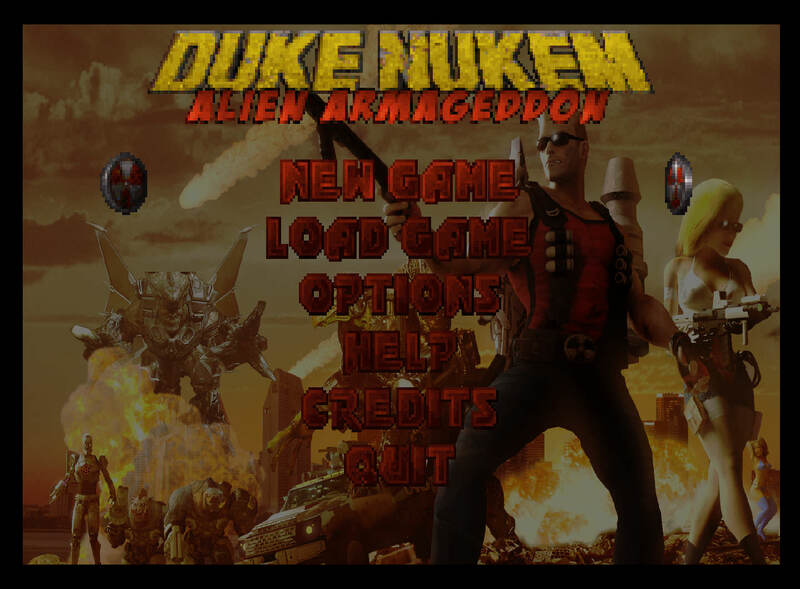 What are some features that you would like to see added to Duke 3D for this mod? Let's keep in mind that it will remain classic renderer compatible (no models or 32-bit) and the core gameplay will remain intact. A lot has already been done, but I'm interested to hear some different ideas. The best suggestions are specific. Example: the nightvision goggles should, in addition to highlighting enemies and live actors, also increase overall visibility by 25%. When Bombshell is added as a playable character, what should her loadout be? She will have an SMG, and she will be able to kick. Other than that, nothing has been determined yet. Should she have a weapon set that is equivalent to Duke's, should she have completely different weapons, or something in between? I think Bombshell should be a glass cannon; all her guns hit hard and fast but she has half the health of Duke (and Atomic Healths only give her 25+ health - normal stuff should heal the same though) Definitely something to differentiate her from Duke other than just being a rule 63 version. Pistol: Manual reload, boring but it makes sense. Shotgun: Switch between regular and N64-style explosive shells - or use up multiple shells for the latter to avoid adding a new ammo type. RPG: Lots of things coyld be done to this. Homing missiles, bouncing rounds, gas grenades. Pipe Bomb: Use alt fire to bring out a new pipe bomb (already implemented in the eduke32 included with the Total Meltdown TC) or put the detonator on alt fire while your standard fire keeps throwing. Devastator: Not sure, it's powerful as it is. Laser Tripbomb: Possibly use alt-fire to manually detonate placed tripbombs. alt-fire modes are a big topic and could make for a whole other thread Currently, pressing the alt-fire key does manual reload on the pistol and uses the scope on the railgun. I'm not sure if I want to add proper alt-fire modes to any weapons. If you have followed other mods that I have coded (DNWMD, WGR2, DukePlus, Attrition, etc.) you know that I love adding lots of firing modes and upgrades to weapons. For AA, I'm taking a much more conservative approach, at least when it comes to Duke's weapons. I propose that we not worry about alt-fire for now, and focus on what Bombshell's weapons should be. 2) Duel wield pistols. More DPS than a single pistol, but longer reload time and burns through ammo quicker. 3) Double-barreled shotgun. Same trade-off as above. 4) SMG. I would give it armor piercing, bleeding or some other effect to make it a little better than chaingun, with the trade-off that you have to reload. 6) A literal bombshell with a remote detonator. Basically it's like Duke's pipebomb with a much bigger and more spectacular explosion, except that you can't throw it very far and you can't carry very many. 7) Self-shrinking gauntlets. While small she can fly around and punch enemies, and they have trouble targeting her. Lasts 10 seconds per charge. Kind of like the Wasp in Marvel. 8) The firework mortar. Shoots a bright shell that splits off into more smaller shells as it sails through the air, creating a deadly fireworks show. 9) An auto-turret; has a time limit or finite ammo. 11) ?? --somethig to go in expander slot. Possibly the Babifier. Turns an enemy into a random babe, or civilian dude. Haha I overlooked the part about Bombshell being playable. What about inventory items, will she have her own versions of those as well? of course this requires extra art, so probably not going to happen. I'm assuming that there isn't going to be a base like in the AMC TC for Duke and Bombshell to deploy from, and levels won't be "missions", but if so, I have one HELL of an idea for an optional boss. I hope there is a level or a section in a level where the new slimer monsters appear, as well as full areas with aquatic enemies, of course this is more related to mapping than code. Yes, I very much want to have that. But we don't yet have an aquatic map in development. Any chance you would want to make one? You would have about 2 months to finish it. I'd better get to work on coding those new enemies then! @Mike: Having two aquatic themed maps would be better than one. Is there any specific global plan about maps? as if there were part of an episode or just single maps? -If Sentry Drones could have less health, that would be great since as it is they're a major pain. If you want to go the Nuclear Showdown route (sorry, JBlade) and up their damage to balance it out, that's fine. Or some other method if you want to avoid stepping on toes. -Being able to shoot Troopers while they're clutching their throat and actually have that have an effect on if they come back or not, that would also be great. I really don't like wasting pipebombs on them every time they manage to somehow fake their way through a fatal gunshot to the head. -Making the holoduke work on things besides just Octabrains (I've always wondered if that was just a bug or what). -Maybe some minor screen shake to give some of the weapons some more oomph when firing? Though that should probably be an optional thing to turn on and off since I know it bothers some people. By all means, any and all ideas that Dan or anybody like from my stuff they're more than welcome to borrow - I definitely find Sentry Drones much more fun to fight when they die to a single shotgun blast but deal a lot more damage in return. With auto-aim and modern mouse control the default ones are just so damn dull to fight. Yes, OGBB2 is a city map. I think the episode will be a bit like World Tour: just a couple of cool maps all centered around their own theme. ...except this one will feature better new enemies and bosses. Yeah, there's plenty of new big bastards to shoot in AA. This is gonna be a big one, innit. Bigger than I was anticipating, at least. And a well coded version of Scorpion Tank and Organic Turret? Also extend the standard meveset of the vanilla enemies could be appreciated, like give the pigcop his melee gun attack back.